Joe Wilson first designed this Killer Whale in 1995. It has never been released as a limited edition serigraph. Joe feels that this print should serve to celebrate the beauty of this magnificent animal, raise awareness, and help ensure its survival. In particular, he points to the Southern Resident Killer Whale Pod (also referred to as “Orcas of the Salish Sea”), one of four resident communities within the Pacific Northwest. It is the smallest of the four, and it is also listed under the Endangered Species Act. As of the end of 2018, this pod numbered 75 members, which is down significantly from 250 a few decades ago. Increased marine traffic, environmental damage, and the depletion of their major food source, Chinook Salmon, are to blame for the reduction in their numbers. Orcas are revered for their hunting skills, their complex societies and strong family bonds. In 2018 the Southern Resident Killer Whale Pod was in the news when a mother carried its deceased calf on her back for two weeks, an incident which attracted international attention. 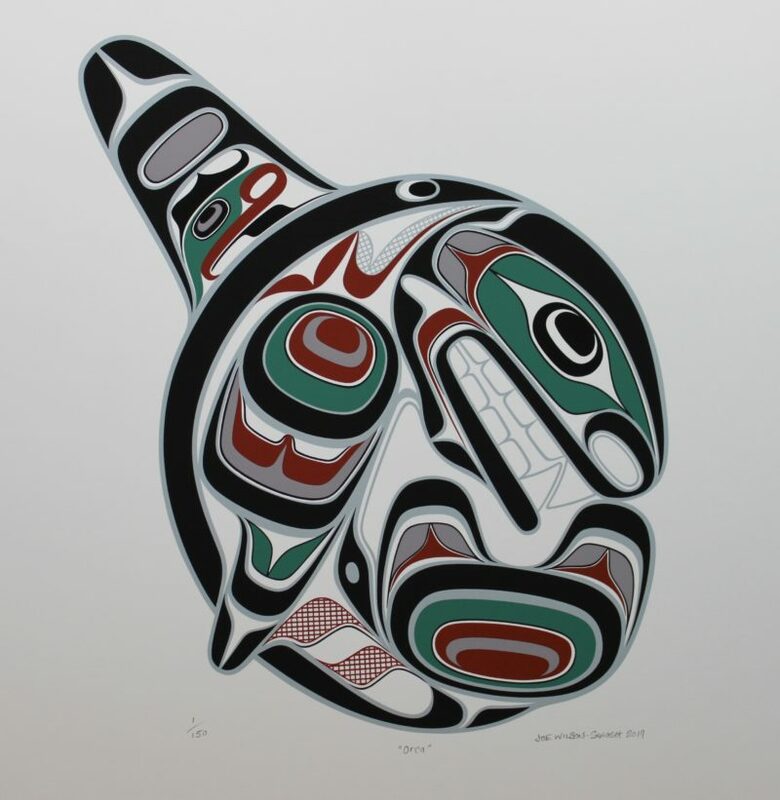 In First Nations cultures of the Pacific, the Orca is represented frequently in their visual works, as well as oral traditions. Known to some as the Guardians of the Sea, Orcas are associated with compassion and strong family bonds. This limited edition silkscreen print titled "Orca" by Joe Wilson was hand produced by the screen printing process. It is the only limited edition printing of this design. The artist has inspected and signed each copy in the edition. All trial copies of this edition have been destroyed and the printing stencils obliterated.